Brenden Adams is 7 feet 4.5 inches tall. He is considered the only person who has grown so fast and so big because of an altered chromosome 12. Brenden Adams was born on September 20, 1995. He was born at Kittitas Valley Community Hospital and grew up in Ellensburg, Washington. His birthweight was an average 7 pounds, 3 ounces and measured at 19.5 inches long. Because of the teen’s never-ending growth, he was diagnosed with a benign brain tumor, a bleeding disorder, a heart disorder, and arthritis in his overgrown joints that started affecting him between the ages of two and eight. With of the fear of leukemia, doctors went in and performed a bone-marrow biopsy so that they could study his cells. To their surprise, the biopsy unveiled that the teen was suffering from a chromosomal disorder that causes him to grow at an accelerated speeds. It is said that only two percent of the population has this “balanced chromosomal inversion”. What happens is that some of the genetic material gets rearranged when the cells divide during the earliest stages of developing. The teen’s 12th chromosome was affected and altered which affects a person’s growth. 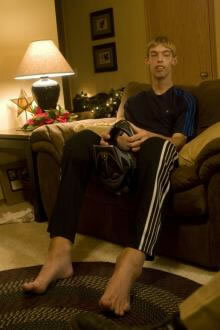 The World’s Tallest Teen, Brenden Adams is not only tall, but he physically and visually is different. His mother says that he constantly needs his team of doctors and visits them frequently to maintain his growth and other physical body changes. The teen has abnormally huge joints, fatty tumors, and extra teeth. 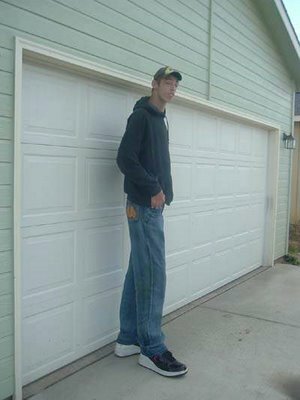 The Guinness Book of World Records names the world’s tallest teen, Brendan Adams as the tallest teen-age boy in the world. Brenden excessive growth was successfully stopped in August 2008. 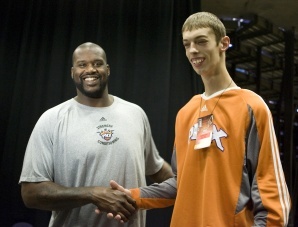 This is something else… At 17 tallest man in the world hmmmm.